This is Hitoshi Nakazato’s second exhibition in Japan. 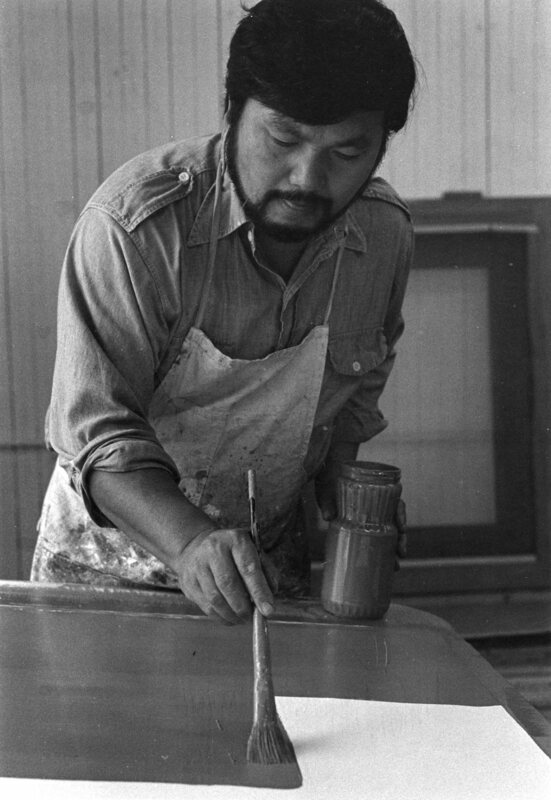 After his return to the United States in 1971, he has based his activities in New York where he lives, and at the same time he has been teaching printmaking at the University of Pennsylvania. He last showed here toward the end of 1970, so we have not had a chance to view his work for a full seven years. 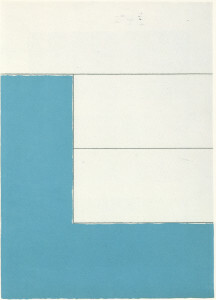 The works exhibited in the 1970 were composed of lines. 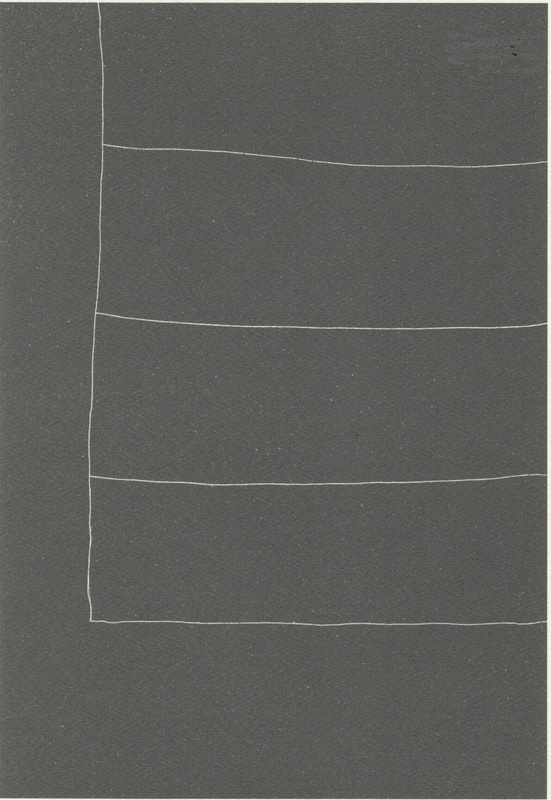 On white paper or on canvas he drew lines with pencil or sumi ink, and on black canvas he drew with white chalk – all lines in parallel arrangement. They were like the lines racing along in graffiti. None of these linear arrangements gave any suggestion of a specific form. 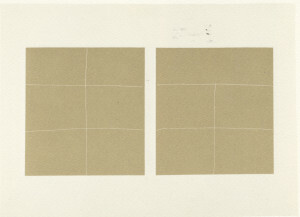 Rather it was the transformation of paper or cloth into a marked surface, or perhaps we might see him as dedicating himself exclusively to turning the planar surface into a sign-space. Because of that, the act of drawing a like the movement of a swimming seal seems to have assumed exclusive importance. The present works are similar to what he made seven years ago insofar as line is a determining element. But this does not mean to say that line takes on the same meaning. In his recent works line has the clearly evident role of dividing a surface, and that surface so divided off appears as a color field. In other words, this is because in the totality of the works he manifestly sets forth that special quality of surface. Nakazato himself explains the process: he first divides off the surface with a line, then colors in that divided surface. Through this he desires to claim or redefine that surface, as he puts it. In this statement Nakazato clearly explains his interest in the planar-surface theme of his recent works. To fill in the surfaces he not only employs acrylic paints, but also sand – one more point of interest. He makes sand paintings, as it were. In Japan we the Edo Period street performance that brought forth the sand painting as a kind of craft, and Nakazato may well have taken a hint from there. Or even more probably, there are the sand paintings of the Navaho Indians in the United States, which may have sparked the suggestion. Whatever be the case, it affords deep interest as an unusual methodology. Too, the process of affixing the sand is not unrelated to Nakazato’s work as a printmaker. 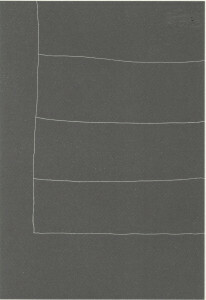 In contrast to the homogeneous surfaces, the line shows forth the hand’s traces, and brings something primitive to the works. This was also found in the works of seven years ago. In that contrast I find emerging from the picture plane that arouses a unique emotion. I have heard Nakazato use the word ‘tension’ when describing the surface of his works, and this tension is not foreign to the contrast I have been talking about. ‘From line to plane’ is a hackneyed expression, and yet those words narrate one of the outstanding accomplishments Nakazato has created of late. I am attracted by that.